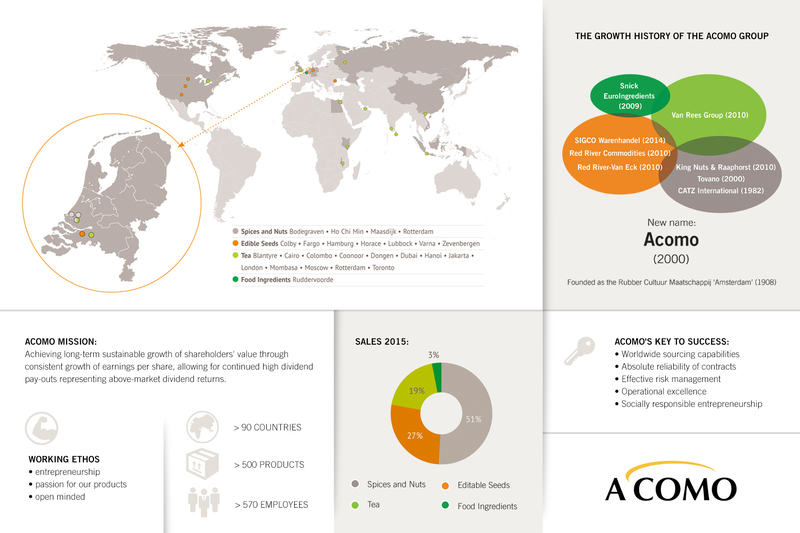 Amsterdam Commodities N.V., better known as Acomo, is the holding company of an international group of companies that buys and sells natural agricultural products for food and beverage industries around the world. As a group our product range comprises more than 500 products, covering more than 90 countries. All group companies are 100% subsidiaries. But all companies trade under their own name and for their own account. To a great extent, they operate autonomously under the responsibility of their own management and financial control. Autonomous value creation within the operating companies is one of two parallel efforts to achieve long-term sustainable growth. The other one is the acquisition of leading companies in niche food commodities and food ingredients. In particular companies where our trading and financial expertise can provide added value for growth. Based on shared principles such as absolute reliability of contracts, effective risk management and socially responsible entrepreneurship, we are committed to adding value to the complete supply chain and focus on above average results. Bridging the needs of our suppliers and clients.